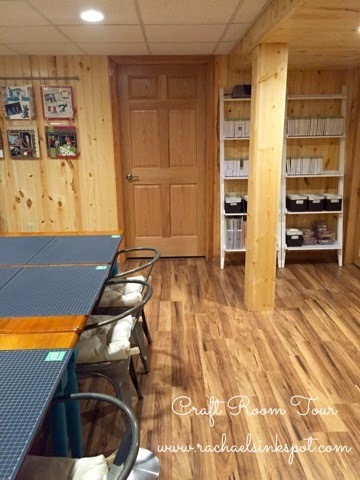 A year ago, my husband promised me a new craft studio in our basement. We had been shopping for new houses for several years and just couldn't find what we were looking for. In what I think was a cry of desperation, he finally said to me, "If you agree to stop looking at houses, we can fix up the basement however you want it." 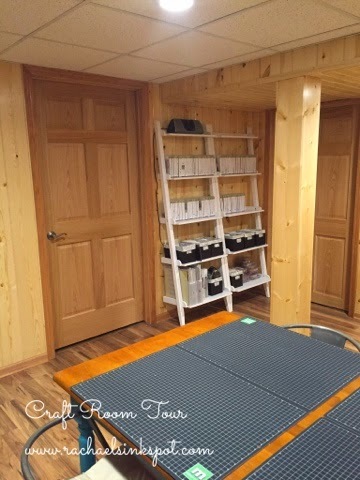 And that, boys and girls, is how my new craft studio was born! It took almost a year to complete the project. The first several months were spent planning and preparing. Construction finally began the beginning of December and was complete by the end of January. This is the view you see when you first walk in. My plan was to hold my classes here, so I needed to have tables and seating. I fell in love with Cathe Holden's teal tables and industrial chairs that I initially found while searching Pinterest (I spent hours and hours on Pinterest during the planning stages). She found her tables at World Market, but there isn't a World Market anywhere near me, so I purchased my tables at Walmart (they were black) and had my friend, Lindsay at Reborn, Restoration and Design, refinish them to teal for me. The chairs I found at Target and added Ikea cushions. Here's a view of the entrance. The adorable chalkboard you see in the corner was made by my mom. I plan to post samples of projects for upcoming classes there. It's a piece I also plan to bring with to any craft/vendor shows I do. 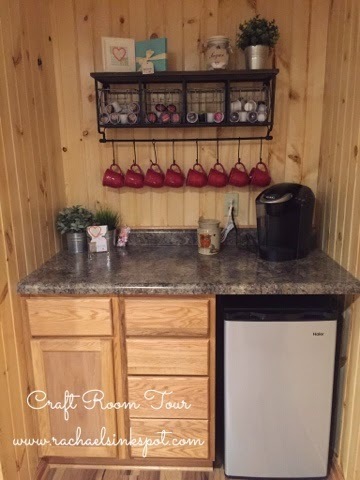 I wanted storage that could also double as counter space for working. These Kallax units from Ikea are perfect! I have two of them (and am planning to get one more!). This one holds all my paper, Big Shot, dies and paper cutters. I use it as a cutting station. 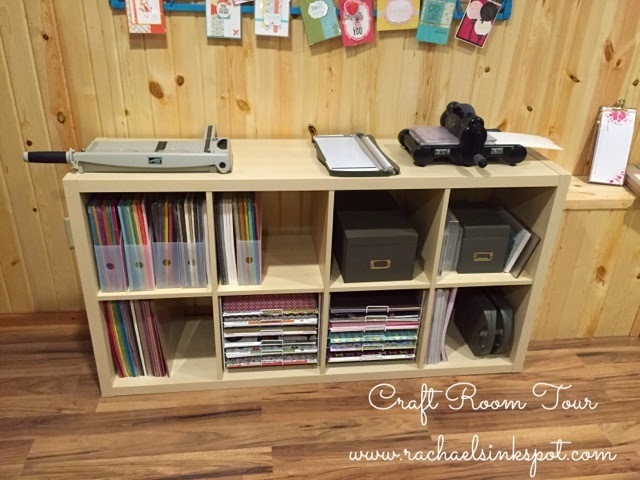 Some 12x12 wire paper racks, that I purchased from a scrapbooking store that went out of business, fit in the cubbies perfectly! The card displays are actually old crib springs that my DH painted teal. Another idea I found on Pinterest! They work perfectly for displaying all the swap cards I got at Leadership. 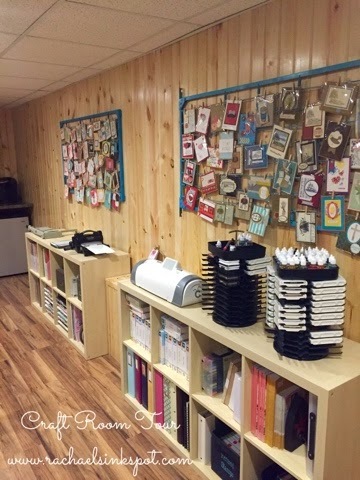 If you look closely, you might recognize mini clothespins from Stampin' Up! holding the cards in place! Here's a close-up of the other Kallax unit. 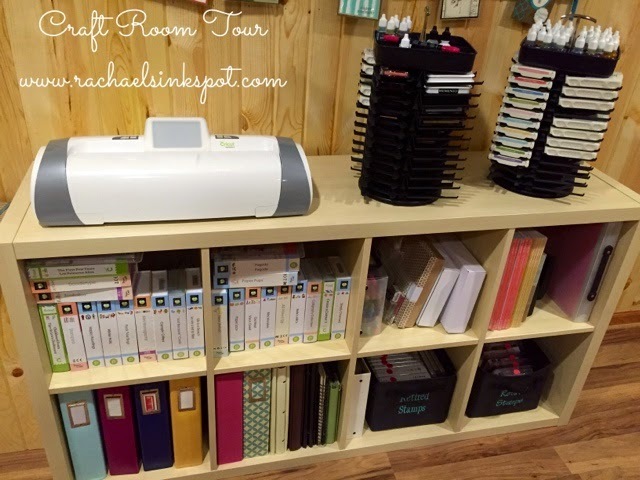 This one holds my Cricut and cartridges, my catalogs, some retired stamp sets and my ink pads. My finished scrapbooks are here as well. I am planning to make some changes here as soon as I make another trip to Ikea to get one more unit (which will stand vertically next to this one). At the far end of my studio, I have two ladder bookcases (from Target) that hold all my current stamp sets and baskets of finished cards. I also have my Designer Series Paper here for now. 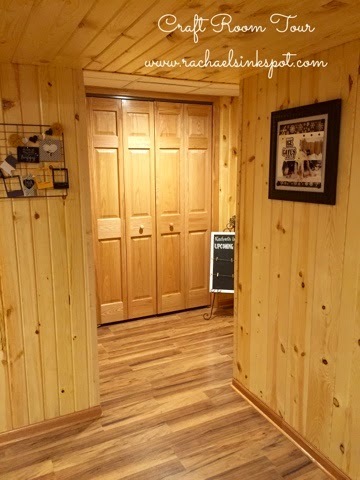 Through that door is our furnace room and storage. To the right of the bookcases is a storage closet where I have a majority of my crafting supplies yet. I am slowly moving in. I always ask my friends to bring their adhesive and scissors with to class, but it's easy to forget sometimes. So, I have these adorable little buckets from Ikea that hold what I like to call "class kits". 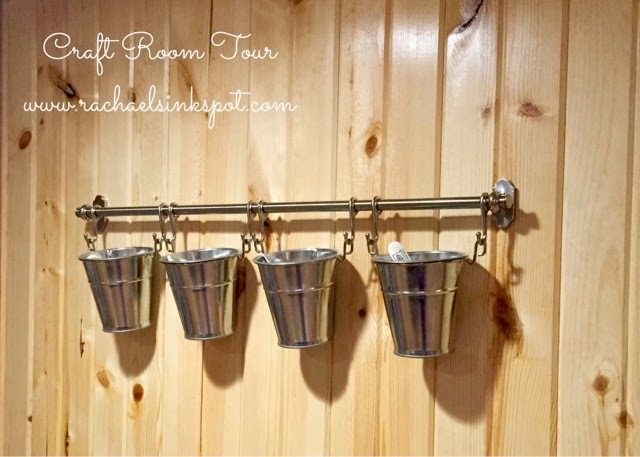 In each pail there is a paper snips, bone folder and liquid adhesive. 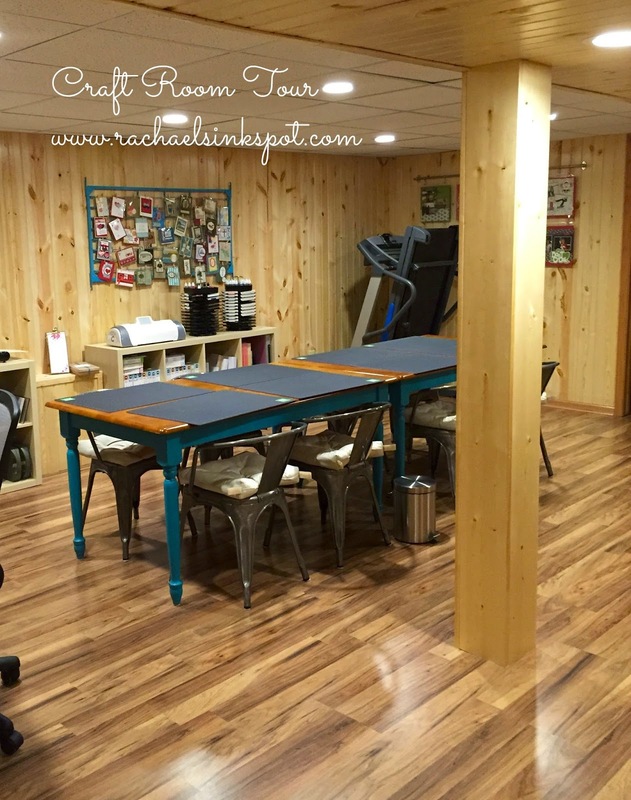 Don't forget to check out my Upcoming Events to see when you can come stamp with me in my new studio! LOVE IT!!! You could be a decorator on the side!! Will have to find time to come see it in person! Thanks Jen! You'll have to come to over and do some crafting!